Rihanna has stepped out looking chic as usual for her latest Fenty Beauty launch which took place in Soho, London, on Tuesday night. The singer-turned beauty mogul dressed up like a typical sunray in a yellow off-the-shoulder satin shirt dress for the event. 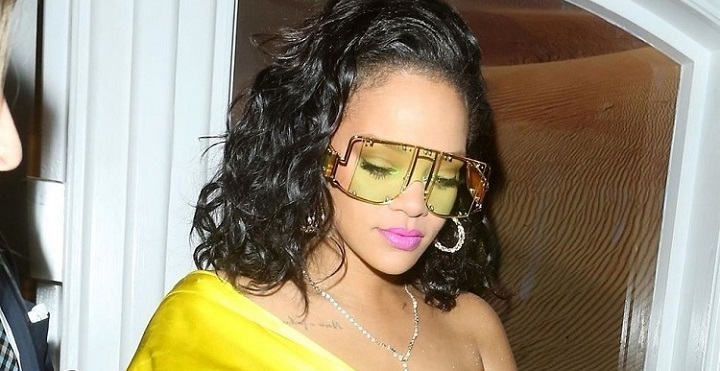 Riri’s bright ensemble look featured a plunging neckline and a short hemline. For accessories, she followed the all-yellow scheme with a matching ankle strappy heels, a small tote bag by Medea, finished with an oversized sunglasses. As one who’s in the real beauty business, her locks were lustrously styled into full wavy curls with plenty of glam make-up. The singer’s London appearance follows the announcement of her new Fenty Beauty Sun Stalkr Instant Warmth Bronzer which comes in incredible 8 shades. According to the 31-year-old, one shade of bronzer can’t be for all the skin tones, adding that it took her over 2-years to develop the epic beauty magic. Attending the event in Soho were famous beauty Youtubers like Alissa Ashley, Nikkie de Jager (a.k.a Nikkie Tutorials), as well as Jackie Aina. I love @badgalriri so much, tonight was amazing ❤️ love @fentybeauty for life!!! The new bronzer will be available for your purchase from 5th April and you can preorder it now on Sephora.com.